PROMOTERS, DJS AND venue owners are to meet tonight in Dublin to discuss issues around licensing and venues in the capital and beyond. The meeting is organised by the group Give Us The Night, which put out an open invite to club operators, managers and promoters to get together tonight “to discuss the Irish club and music scene and how we can look at improving it in terms of licensing, venue landscape”. 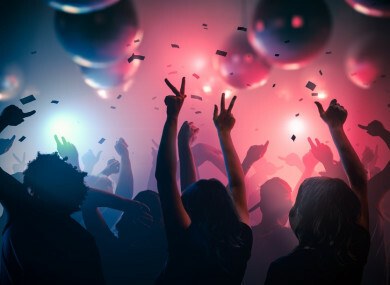 Among the issues due to be raised are Ireland’s late-night licensing laws, the imminent closure of large clubs District 8 and Hangar, and issues faced by smaller and mid-sized clubs. The people behind the Give Us The Night campaign say they “are hoping to get those who work in the industry talking more about what could be done to improve it”. Much has changed in the last few years; while big venues and events have enjoyed a golden period, small to mid-sized clubs have struggled under the high cost of running nights that last just three-four hours. Some of our best venues will soon be demolished while the nightclub owners association, the INIA, has dissolved, which all in all leaves us at an important crossroads. DJ Sunil Sharpe of Give Us The Night (GUTN) told TheJournal.ie that high on the agenda for tonight’s meeting is a discussion of licensing laws. GUTN was set up in the mid-2000s and Sharpe said that “in recent years there’s been no political will to even look at our licensing laws, let alone talk about them or say they’ll do anything about them”. He said that much of the discussion around licensing laws affecting nightclubs has tended to focus on the sale of alcohol, which is “frustrating”. But he said that at the same time, he feels “a new energy and a new enthusiasm in the Irish music scene”. “I feel a lot of people are talking about this again, we realise how overdue change is and now I’m feeling a new appetite for this,” he said. In addition, because the Irish Nightclub Association has dissolved, GUTN has put a callout to nightclub owners to ask them to be part of the conversation. We can spearhead a strong national campaign here but we need the help of the business people within this industry to help push us forward as well. He said that people from all over the country are due to attend the event tonight. Sharpe added that €410 is paid by venues in late licensing fees, and that this money could be used in part to help the music scene. That sum can be “crippling for small venues”, he said. He said that “we are living in a Ireland that really hasn’t changed in 20 years” with regards to licensing laws. “It’s a Third World nighttime industry, it’s laughable what we have here, but what we do have though is a spirit in our people that’s unrivaled,” said Sharpe. People come to this country and they love the atmosphere in our nightclubs, they love the vibrant feel of nightclubs here but they can’t understand why we shut at 2 or 3 am. He also noted that Dublin has different laws around opening hours compared to the rest of the country, and that the campaign wants to be focused on what’s happening nationally. He said that once longer hours are introduced, he believes “people will realise it doesn’t infringe on them, it makes no difference to their lives and enriches other people’s lives”. Sharpe said that in some countries, clubs are recognised for their cultural significance, such as Berghain in Berlin. GUTN has been in contact with the Justice Department on the issue. For more information on the campaign, visit the Give Us The Night website. Email “'It's laughable what we have here': DJs and venue owners call for longer licensing hours ”. Feedback on “'It's laughable what we have here': DJs and venue owners call for longer licensing hours ”.